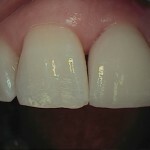 Bonding: sometimes instead of a porcelain veneer, a natural colour ‘composite’ material is used. 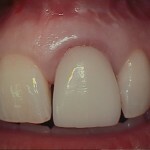 A natural-coloured filling material can be used for minor repairs to front teeth like chipped or broken tooth corners. If a tooth has been broken or weakened by a large filling or a lot of decay, your dentist may recommend fitting a crown (or cap). A crown looks just like a healthy natural tooth. It is made in a laboratory and then cemented over the top of the damaged tooth, to disguise it. For teeth near the front of the mouth, crowns are made of ceramic materials. Crowns on back teeth may be made of ceramic, gold or a gold/porcelain combination. Inlays and onlays are similar to fillings (in that they fill a hole in your tooth). However, like crowns, they are made in a laboratory and then cemented to the tooth with special glue. Inlays and onlays are strong and can be an attractive alternative to amalgam fillings. They are suitable for the grinding surfaces of the back teeth and can be made out of gold, porcelain or tooth-coloured filling material.